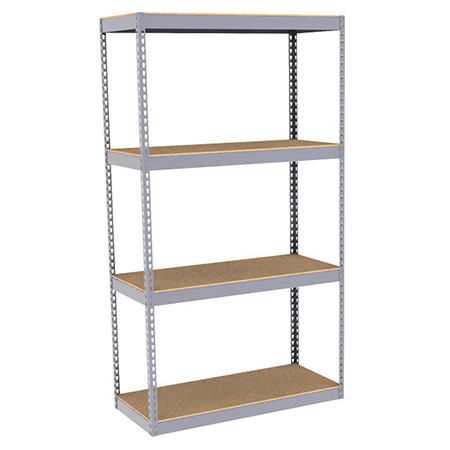 Boltless shelving is the ultimate workhorse when it comes to industrial shelving. Having the most economical price tag it is found in store rooms and warehouses of every type of company imaginable. Since boltless shelving does not use back or side sway braces product can be loaded from any direction. Boltless shelving is hardware free; requiring no bolts or clips to assemble reducing costs and making assembly easier. Boltless shelving is completely customizable and is available in a variety of widths and depths from 12” to 96” and heights from 3’ to 24’ high. Shelves can be adjusted every 1-1/2” making the perfect fit for your product. Capacities start at 250 pounds per shelf and go up to 1,750 pounds per shelf depending on your needs. Just like the dimensions, shelf surfaces are customizable in many different options. Particle board is the most economical option and is a very durable shelf surface that comes standard on most boltless shelving units. Other options include laminated wood, wire deck, and steel surfaces. Boltless shelving can be used in many different applications. The shelving units can store small pieces to bulky items to being specific sizes for archive boxes. Other applications include work benches or work surfaces, tire racks, multilevel mezzanines, battery racks, mobile aisle systems, mobile shelving units and so much more. Kaco is a proud distributor of Rapid Rack, the industries leader in boltless shelving. We stock nearly every component in our Phoenix warehouse new, but we also stock used product for the cost conscious consumer.